It’s that time of year again, when Bath gets even more beautiful with a Christmas makeover of garlands of lights. Come along to SouthGate Street North for an evening of festivities with free local entertainment from The Pauline Quirke Academy, Children’s Hospice South West, Bath Light Operatic Group and Theatre Royal Bath. Festive entertainment begins with a Lantern Parade from The Pauline Quirke Academy and St Martins Primary. The great man himself, Santa, will be making an appearance and switching on the lights at 6pm. Discover SouthGate’s bright red Routemaster bus which will be serving delicious drinks and interactive entertainment from 16th November to 6th January 2017. Join us for an evening of merriment and festive surprises from 4pm. Bath is set to sparkle. 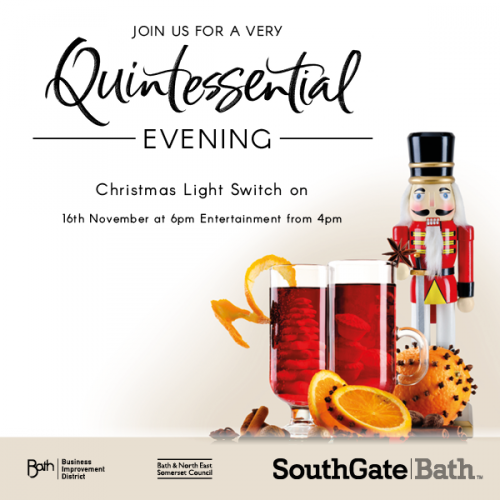 The Bath Lights Switch On is brought you by SouthGate Bath, Bath Business Improvement District and Bath & North East Somerset Council.